This year’s event was well up to the mark: 176 entries from 18 exhibitors, including three from Belgium and two from Britain. Best in Show and Best Gold was awarded to Jules Etienne’s clear cap gold hen, while the Leijen-Staal partnership won Best Silver, also with a clear cap hen. You can see the full results here. There were two styles of Lizard canary on show: the classic English type and the Dutch type. The Belgians, the British and a few of the Dutch exhibitors favour the former. The majority of the Dutch Lizards are smaller; their ground colour is paler; the black markings are not so intense; the rowings tend to be thin stripes rather than chains of individual markings; and many were too long in the cap. The English style birds are bolder in size, colour and markings, although they have their faults too. The judges shared the medals across both types. This was the third year in a row that Best in Show was awarded to a clear cap gold hen. 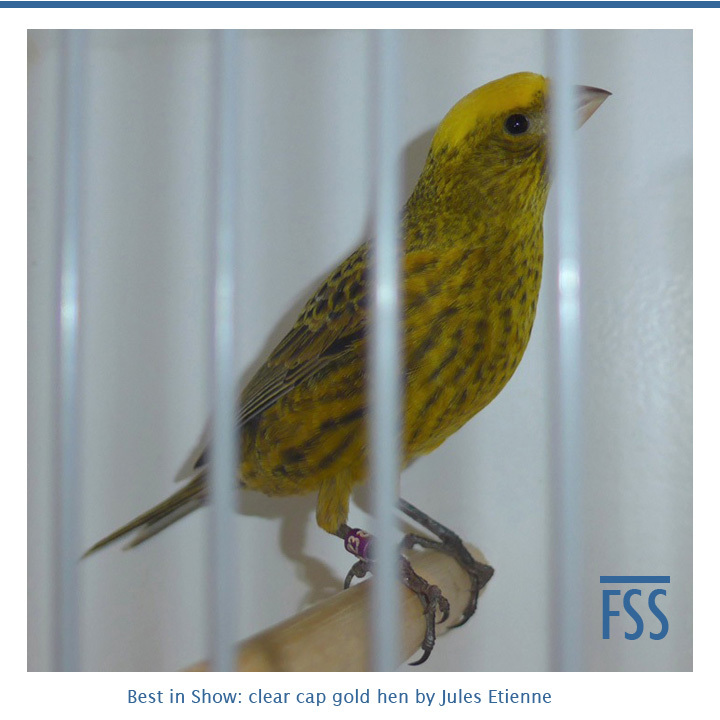 Jules’ bird was a worthy winner of Best Gold, but in my opinion, the overall standard of the silvers was better; the classes for clear cap silvers and non cap silvers were outstanding. I do hope that the judges aren’t falling into the trap of choosing a clear cap gold by default. Apart from the well-known winners like Jules, Pedro & Gerrit, it was good to see that some less famous breeders were also in the medals: Benny Buiting and Mr. Bol who have supported the show for years; Hans Klaus had another successful show, yet is in only his second year; and Jean de Groot, a real character and breeder of birds with some of the best rowings in the World. Every year there are some unlucky losers; top quality birds that come up against three that are even better, and therefore miss out on the medals. Three caught my eye: a clear cap silver hen from Kees Everaers; a non cap silver hen from Marko Dielen; and another non cap silver hen from Joe Coakley. All were birds with broad backs that displayed beautiful spangles, and full breasts with profuse rowings. Proficiat ! My thanks to Harry Kapel for the photographs. ← The Best Lizard Canary Show in the World?